Kiss the Crucifix and sing yourself with the Rosary Crucifix, saying at the same time. O My Dearest Mother Mary, behold us your children in prayer at your feet. Accept this Holy Rosary, which we offer you in accordance with your requests at Fatima, as a proof of our tender love for you, for the intentions of the Sacred Heart of Jesus, in atonement for the offenses committed against your Immaculate Heart, and for this special favor which we humbly request in This Rosary. (Here mention your request) We beg you to present our petition to your Divine Son. We ask it for the greater glory, of GOD, for your honor, and the good of all Souls. If you will pray for us we cannot be refused. We know, dearest Mother, that you want us to seek GOD's Holy Will concerning our request. If what we ask for should not be granted, pray that we may receive that which will be of greater benefit to our soul. Sweet heart of Mary be our Salvation, Amen. For an increase of Faith, Hope, and Love, and then on each of the next three bead recite one Hail Mary. On Bead One in Set of Three, For an increase of Faith say one Hail Mary. O my God, I firmly believe that You are one God in three Divine Persons, Father, Son, and Holy Spirit; I believe that Your Divine Son became man and died for our sins, and that He will come to judge the living and the dead. I believe these and all the truths which the Holy Catholic Church teaches, because You revealed them, who can neither deceive nor be deceived. Hail Mary, full of grace the Lord is with thee; blessed art thou among women, and blessed is the fruit of thy womb, Jesus. Holy Mary Mother of God, pray for us sinners, now and at the hour of our death. Amen. On Bead Two in Set of Three, For an increase of Hope say one Hail Mary. O my God, relying on Your infinite goodness and promises, I hope to obtain pardon of my sins, the help of Your grace, and life everlasting, through the merits of Jesus Christ, my Lord and Redeemer. On Bead Three in Set of Three, For an increase of Love say one Hail Mary. O my God, I love You above all things, with my whole heart and soul, because You are all-good and worthy of all love. I love my neighbor as myself for the love of You. I forgive all who have injured me, and I ask pardon of all whom I have injured. Lord Jesus Christ, Son of the Living God, Have mercy on me, a sinner. 2	At the end of the ten Hail Marys say One Glory be to the Father, etc. "O my Jesus, forgive us our sins, save us from the fire of hell, lead all souls to heaven, and help especially those most in need of Your mercy." Hail, Holy Queen, Mother of Mercy, hail, our life, our sweetness, and our hope. To thee do we cry, poor banished children of Eve: to thee we send up our sights, mourning and weeping in this vale of tears. Turn, then, most gracious Advocate, thine eyes of mercy towards us, and after this our exile, show unto us the blessed fruit of they womb Jesus. O clement, O loving, O sweet Virgin Mary!. V. And may the souls of the faithful departed, through the mercy of God, rest in peace. Saint Michael, the Archangel, defend us in battle; be our protection against the wickedness and snares of the devil. May God rebuke him, we humbly pray; and do Thou O Prince of the heavenly host, By the Power of God - Drive into hell Satan and all the other evil spirits who wander throughout out the world seeking the ruin of Souls, AMEN. Remember, O most gracious Virgin Mary, that never was it known that any one who fled to thy protection, implored thy help, and sought thy intercession, was left unaided. Inspired with this confidence, I fly unto thee, O Virgin of virgins, my Mother; to thee I come; before thee I stand sinful and sorrowful. O Mother of the Word Incarnate, despise not my petitions, but, in thy mercy, hear and answer me. Amen. 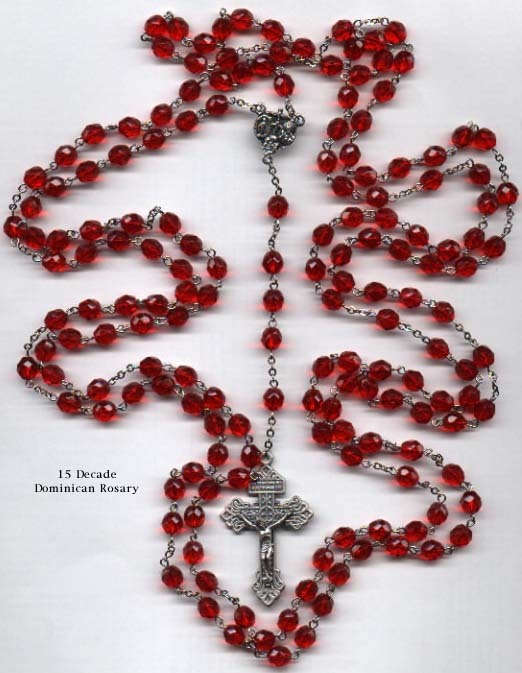 The information on this page is for the 15 decade Rosary. If you are looking for the Luminous Mysteries see the prayers for the 5 or 20 decade Rosary.